We have streamlined this fun project into 2 class sessions. You need a Serger that is capable of doing at least a double cover stitch, triple is even better? We'll open up a sweatshirt, lay- out some pre-cut jelly roll strips, add a little creativity and stitch the day away. The completed project is a show stopper. We constantly hear from students that are wearing this that people always stop and comment. You can get crazy and fun or simple and elegant. You will learn a ton from this class and want to make one for each season! Price includes machine rental, sweatshirt, and pattern. You will need to bring a jelly roll or 40 coordinating strips of 2-1/2" cut WOF. Fun coordinating threads including Cortonas and/or cording that you have made will work great for taking this up a notch and making it unique. If you having a double fold bias binding attachment for your serger, completion is a breeze. 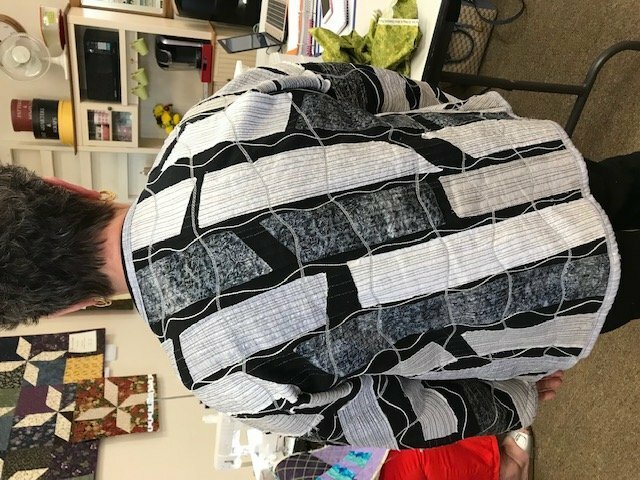 We recommend a serger that has an extended throat such as the Ovation or Triumph to really knock this one out quickly. Yep that's a student wearing her project after taking this class!